Can Anyone Catch America In Plastics? Forbes.com — Ethane prices recently hit a four year high. Demand is finally catching up to supply, which is ample. Although this garnered far less attention than the crude oil rally, increasing supplies of ethane are an unappreciated element of the Shale Revolution. Ethane, once converted to ethylene through “cracking” is the principal input into production of polyethylene. Simply put, ethane is turned into plastic. Polyethylene is manufactured in greater quantities than any other compound. The process is fascinating, and naturally the internet provides ample information. Ethane molecules are broken through heating (“cracked” in industry parlance), and the ethylene produced undergoes further processing into polyethylene pellets. These plastic pellets come with different properties such as strength, flexibility, melting point, which determines their ultimate use. They are heated and molded into many thousands of consumer and specialty products. 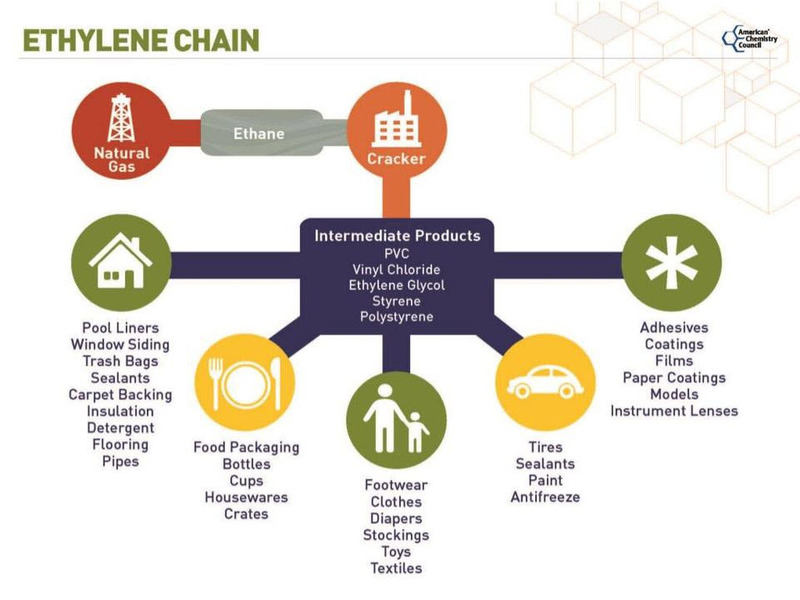 For an absorbing description that follows ethane molecules from extraction to ultimate use, the Houston Chronicle’s three-part series Texas petrochemical plants turn ethane into building blocks of plastic is highly readable. Among many fascinating steps, we learn that molten polyethylene pellets are blown into a very thin cylindrical balloon, several hundred feet long. This is then turned into sheets by passing through rollers, and multiple sheets are combined depending on the desired thickness. In the article, these ethane molecules ultimately traveled as plastic pellets to Vietnam where they were processed into packaging for frozen shrimp that was shipped back to the U.S. The petrochemical industry makes this happen. U.S. ethane production has more than doubled in the past decade, to 1.5 Million Barrels per Day (MMB/D). Ethane is a gas and isn’t shipped in barrels. The MMB/D unit of measure converts the energy content of the ethane to that in a barrel of crude oil. Barrels of Oil Equivalent (BOE), allows volumes of most hydrocarbons to be measured using a common metric. What further sets the U.S. apart is that the shale’s light crude comes with relatively high concentrations of NGLs, including ethane. It simply needs to be separated out. The alternative source of ethane is as a by-product from refining crude oil, a more costly approach. The U.S. is producing so much ethane that some of it is being mixed in with the methane natural gas stream as it can’t be profitably used elsewhere (known as “ethane rejection”). Low ethane prices with the promise of ongoing ample supply have led to a flurry of new petrochemical investments. Cheap natural gas lowers processing costs, since the conversion of ethane to plastic pellets requires heat. For example, Exxon Mobil (XOM) operates one of the world’s largest polyethylene plants in Mont Belvieu, TX, with ethylene provided by a new facility at their nearby Baytown complex.